You’ll probably hear a lot of things when it comes to feeding horses which can be confusing, especially for the first time horse owners. Some of these things have been passed down from generation to generation. Some of the information is useful, but some of it is outdated and won’t apply to your horse now. Fact: Horses were meant to eat off of the ground and not fed in elevated feeders. When you feed your horse in an elevated feeder they won’t chew their food properly as the lower jaw is meant to slide forward into the grinding position which happens when the head is down. Horses fed in elevated feeders will have improper tooth wear, increased risk of choke, and respiratory issues from inhaling the dust and mold in the hay and grain. Fact: Mature horses that are not being worked or that are being lightly ridden are unlikely to need grain. Those that probably need the extra energy that grain provides is nursing broodmares, racehorses and those competing in other competitive sports. The most important thing for horses is forage being pasture or hay. Their digestive system was meant to break forages like plants not the high amounts of carbohydrates from grain. Giving high amounts of grain can cause your horse to colic, develop laminitis or ulcers. Fact: If you’re feeding your horse more than they can burn off through exercise they will have excess energy and will be bouncing off the walls. Corn contains more energy and less fiber per pound than oats, but oats generate more heat units in digestion than corn. Oats, however, contain an alkaloid called avenin, which is a central nervous system stimulant and some horses are sensitive to the avenin. If you feed corn and oats together do a half and half mixture and go by weight not volume. You can also add rolled barley which is a cooling grain to the mixture. Fact: Although they love the taste and their manure becomes softer it is not good for them. Bran is nothing more than an intestinal irritant, not a laxative and is high in phytates which will block calcium. It has ten times more phosphorus than calcium and with that out of balance ration it can lead to poor muscle contraction/relaxation and porous bones. You would be better off feeding your horse soaked hay pellets. Fact: Pellets in general don’t cause a horse to choke its the behavior of bolting the pellets down or dental problems that cause the choke. I’ve seen horses choke on hay, large hay cubes, apples, carrots and other treats. Choke is caused from horses that bolt their food down because they are aggressive eaters. If your horse has dental issues it can also cause them to choke because of improper chewing. 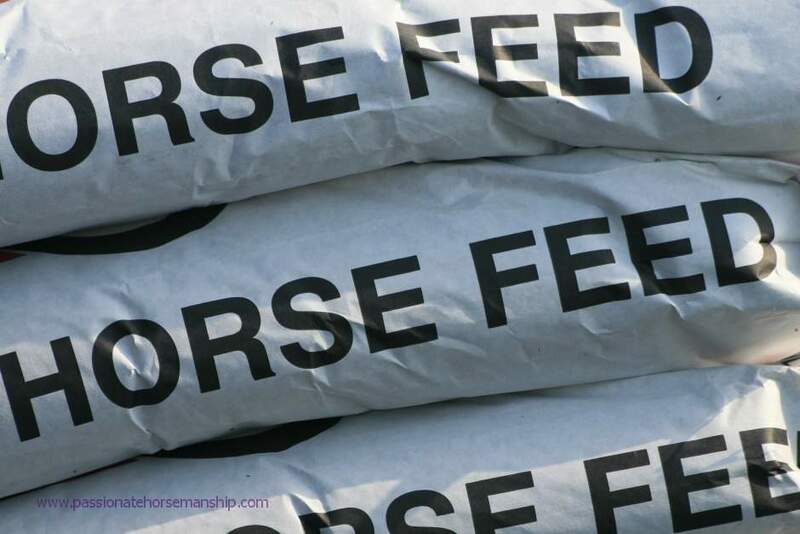 To help discourage a horse from bolting their feed down place some large rocks in their feed pan or give them smaller portions several times a day. Do you have anything you would add to the list? If so leave me a comment below I’d love to hear from you. That makes sense to me. Thanks for the info Miles.